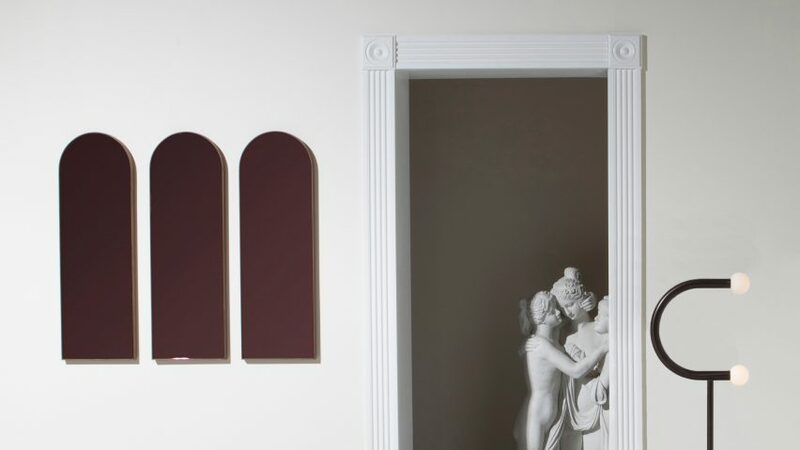 Brooklyn-based Bower Studios has expanded its collection of trompe l'oeil mirrors with designs that look like arcades, porthole windows and arched doorways. Bower released the seven designs named Orca, Egg, Arcade, Capsule, Quarter, Full Quarter and Slim Archway to coincide with this year's NYCxDesign festival. The septet forms an extension of the studio's series of graphic mirrors, which were presented at New York's International Contemporary Furniture Fair last year. As with these designs, some of the new pieces are intended to appear three-dimensional – an effect known as trompe l'oeil in the visual arts. Among these is Orca, featuring a piece of black glass shaped like a crescent moon that makes the full design look like a circular opening, and the Slim Archway, which comprises two tints of glass to create a similar illusion. "Each decorative, functional mirror is intended to add dimension and texture to any space," said Bower in a statement. "The unique designs of some of the pieces make them appear to be three-dimensional, but all the mirrors are flat." A smaller arch-shaped mirror, called Arcade, also creates an illusion when several are lined up side by side. "The Arcade Mirrors also have a 3D effect, as when they are hung next to each other as a series of arches, the gaps in-between tend to pop out, seemingly like columns between the mirrors," Jeffrey Renz, a partner at the studio, told Dezeen. The four other new designs include Egg, aptly named after its shape, and Capsule, with an outline that resembles a medicinal pill. Curved corner details are found on Quarter and Full Quarter, which follow the same shape but are different sizes. All the mirrors are produced at the design team's studio in Brooklyn's Greenpoint neighbourhood. The designs can also be customised for specific requirements. The glass is available in a "variety of coloured and antiqued tints", frames are either solid black walnut or white oak, while sizes can also be adjusted. Bower Studios launched the extended collection to coincide with NYCxDesign, the annual citywide festival that is running 11-23 May 2018 this year. The mirrors are currently on display in a "mini-showroom" adjoining Bower's space. Also for NYCxDesign, the studio teamed up with actor Seth Rogen to create a mirror that looks like a beach ball. The design is one of several designer-celebrity collaborations commissioned for the Sight Unseen Offsite exhibition.